Lemax The Scrooge Figurine single dickensian miniature on a single base depicts Ebenezer Scrooge who is the main character of Charles Dickens 1843 novel 'A Christmas Carol'. Scrooge is a street scene character addition suited for placement in a Lemax seasonal Christmas miniatures display. One of the most popular timeless figurine additions to the Lemax Caddington Village catalogue, joining the collection in 1999. 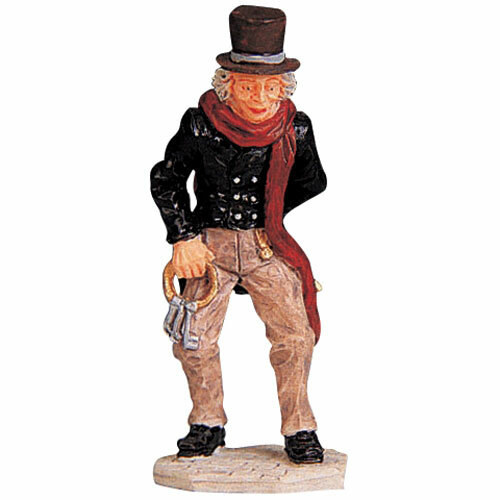 Scrooge is an individual hand painted polyresin figurine mounted on a single street base to compliment your seasonal Lemax Village display. After receiving a Scrooge from another shop whose paint Job was all wrong and he had a bright red face I was pleased to receive this one in perfect condition ready for Christmas.